This was such a fun & clever read! I'm not really a supernatural or superheroes person (I like aliens, vampires & wearwolves but I've never seen or read X-Men & the like) but this novel was so amazing I may be a convert. The opening of the story has our heroine, Myfanwy Thomas, having just survives a rather harrowing ordeal & awaking drenched in the park surrounded by dead people wearing laytex gloves. And she has no memory of who she is. The story takes us along as she learns about her predecessor & also becomes her own person. I won't go into the spoilers because I think the story's strength is in the reveals. There was plenty of wry wit to go around & I actually laughed out loud. I found the other characters very compelling. Gestalt is both attractive & squick inducing, from beginning to end & the field ops Myfanwy finds herself on will not be forgotten for some time. The author's descriptions are very well done. My only departure of thinking this was all-time were two things. As another reviewer mentioned, Ms. Thomas is thirty-one but she seems to have no sense of her own womanhood. I wanted to allow that according to what we read, the first incarnation didn't have any either but the second version seemed to be able to come into her own & break away from the first so much, I didn't understand why she retained the rampant prudishness. No accomplished, 30+ year-old with so much power should repeatedly blush & threaten to lose composure when she simply realizes that a man in the room happens to be handsome. I get that probably she had baggage due to the way the training she endured & has intimacy issues but (view spoiler)[ she seemed pretty keen to embrace completely-unknown-sister, Bronwyn. (hide spoiler)] So quickly & with so little credulity that I was worried it was a ruse. Maybe this was set up to show that it was another break from Myfanwy 1.0 but I wasn't sold. I did like that she & Shantay struck up a friendship. I'm holding on to the hope that the (view spoiler)[ card she finds in the shirt pocket means she'll give the man from the hotel who lent her the shirt a call & get herself a little romance. 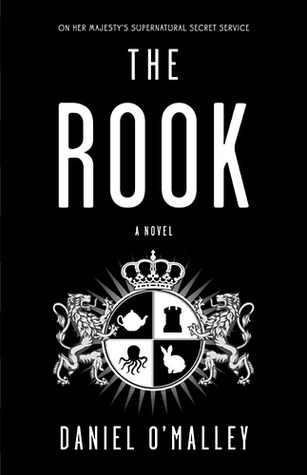 Sign into Goodreads to see if any of your friends have read The Rook.